If you see a sink piling with dirty dishes, a mud stained soccer jersey, or an accidental pet accident in the carpet you know immediately to clean it up. However some spots just don’t come to mind so easily – but should be loved just the same! YOUR CEILING FAN: This spot can easily be cleaned in just 15 minutes. Be sure to turn your fan off (it’ll make it easier!) Use a stable ladder or stool to prop you up. Remove the motor cover and use canned air to clean the electronic bits and pieces. 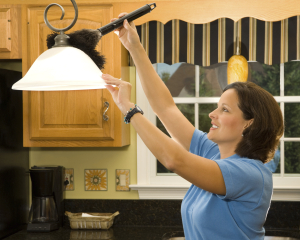 Once the dust is removed use a rag sprayed with all-purpose cleaner and wide down each blade. You’ll notice that the tops of the blades are loaded with dust! YOUR CLOTHING HAMPER: You mean I don’t just clean the clothes? No way – think about it, this is the home and sanctuary of all things dirty. Use an all-purpose cleaner on the hamper and let it dry before you add more dirty clothes to it. To keep it smell free you can consider sprinkling baking soda over the hamper after some smelly fabric have hung out in there. YOUR COFFEE MAKER: Believe it or not but every time you make that delicious cup of coffee in the morning it leaves behind a little bit of residue – so by the time you get to your third pot of the week you can completely fall it a fresh pot! If you pour a three cup white vinegar and six cup water mixture into the reservoir and run the pot as normal you can begin to clean out the residue. When the coffee maker is finished let it sit for 15 minutes. After this run two water-only pots to remove the vinegar.